Washington Street is an unassuming country road in the Napa Valley that also happens to be the epicenter of Thomas Keller’s culinary empire. His flagship restaurant, The French Laundry, put Yountville on the map, but Keller also operates Bouchon, Bouchon Bakery, and the happy accident down the street known as Ad Hoc. As its name implies, Ad Hoc was supposed to be a temporary six-month experiment before Keller opened a restaurant specializing in gourmet burgers and wine. But Ad Hoc proved to be so popular that it’s now become a permanent member of Keller’s restaurant family, and the “burgers and bottles” concept was put on the back burner. Under the leadership of Chef Dave Cruz, Ad Hoc serves a different four-course set menu every night, showcasing the best of American comfort food, including braised beef short ribs, roasted Kurobuta pork, hangar steaks and their legendary fried chicken. Each meal consists of a salad course, main course, cheese course and dessert. If you finish your meal and want a bit more, you can always ask for seconds and they’ll happily bring you more. Wine selections are plentiful, and the young, energetic staff is happy to help you pick an appropriate wine. The Frisee and Mache Salad was excellent, especially when you consider that I’m not much of a duck fan because I usually find it too fatty and the flavor can be overwhelming. But this duck leg was the exact opposite; it was succulent and flavorful without dominating the salad, and I forgot I was eating duck for a second. Fried capers were a revelation…they look like they burst open, kind of like miniature bits of fresh green popcorn (or would that be pop-capers?). The duck skin cracklins were a great substitute for bacon bits; there’s nothing like crunchy fried bird skin is there? The main course of Braised Beef Short Ribs was an eye-opening entree. Our waiter said the meat was braised for 48 hours, which was confusing to me until one of our dining companions revealed that it was technically a sous vide. I had no idea what a sous vide was at the time, but soon learned that this technique produces some of the most delectable meat I’ve ever eaten. Cutting into the meat was like moving a hot knife through butter, but the meat didn’t fall apart. Each slice of meat melted in my mouth and had a really rich, beefy flavor with a hint of citrus from the orange zest. Not only was this among the finest meat dishes I’ve ever eaten, it made me curious enough about sous vide to explore the possibilities of doing it at home. The cheese course consisted of Camembert wedges and slices of the freshest nectarines I’ve ever had the pleasure of eating. You tend to forget how good fresh fruit really tastes if your only source is the local Safeway. Dessert was a seemingly simple Mixed Berries and Cream with delicious house-made granola from Bouchon Bakery. The twist here is that the whipped cream is mixed with a little creme fraiche and buttermilk, which made it more decadent than one might think possible. I never thought I would go ga-ga over a blueberry and raspberry parfait, but in the right hands, anything can be positively sinful. Ad Hoc’s casual atmosphere and easy-going staff make it easy to relax and enjoy a truly superb meal. What’s most striking about the dining experience was the simplicity of the food. It’s basically comfort food that’s been refined or redefined by using different techniques and fresher ingredients that elevate it to a higher level. If Ad Hoc is the low-hanging fruit in the Keller kingdom, then I can only imagine how good the food is at Bouchon and The French Laundry. I think I’ll start saving my pennies now. It was listed on the menu as buttermilk fried chicken…not sure what the actual breading was, but I know they do a spicy version as well. I talked to Chef Dave about doing a Chicken and Waffles thing and he said that they had a brunch where they did Duck Confit and Waffles, and apparently Keller is a fan of Roscoe’s. Good to see you went back. I liked it so much, I went two days in a row. Any hunch on how the chicken was seasoned or what fat they used? 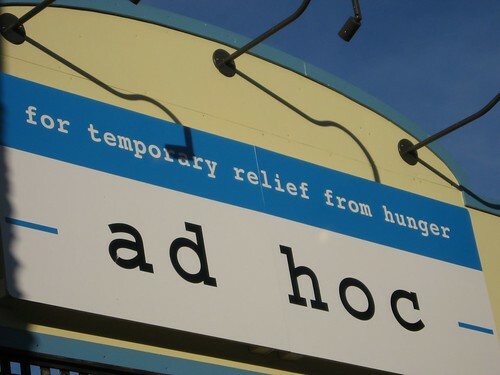 I’ve been researching about ad hoc since I’m going there for brunch in December. it was the only way I could fit it in my schedule. Thanks for the menu archive. I was worried that brunch wasn’t going to be as good as dinner but I’m really looking forward to it now. Love your website! That tapa post brought so many memories from breakfasts back home. Thanks. Great blog! Definitely the right choice for Mr. Keller to keep Ad Hoc going vs. upscale burgers. Look what happened to the other famous Keller (Hubert) when he went with a burger concept! Spectacularly mediocre.